Virtual Reality | Oculus Rift – Consumer Reports – Carpet Bomberz Inc. Imagine being able to immerse yourself in another world, without the limitations of a TV or movie screen. Virtual reality has been a dream for years, but judging by current trends, it may not be just a dream for much longer. 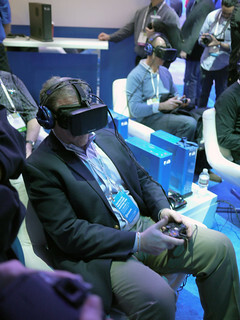 via Virtual Reality | Oculus Rift – Consumer Reports. I won’t claim that when a technology gets written up in Consumer Reports it has “jumped the shark”, no. Instead I would rather give Consumer Reports kudos for keeping tabs on others writing up and lauding the Oculus Rift VR headset. The specifications of this device continue to improve even before it is hitting the market. Hopes are still high for the prices to be reasonable (really it needs to cost no more than a bottom of the line iPad if there’s any hope of it taking off). Whether the price meets everyone’s expectations is very dependent on the sources for the materials going into the headset, and the single most expensive item are the displays. OLED (Organic LED) has been used in mobile phones to great effect, the displays use less power and have somewhat brighter color than backlit LCD panels. But they cost more, and the bigger the display the higher the cost. The developers of Oculus Rift have now pressed the cost maybe a little higher by choosing to go with a very high refresh rate and low latency for the OLED screens in the headset. This came after first wave of user feedback indicating too much lag and subsequent headaches due to the screen not keeping up with head movements (this is a classical downfall of most VR headsets no matter the display technology). However Oculus Rift has continued to work on the lag in the current generation head set and by all accounts it’s nearly ready for public consumption. It’s true, they might have fixed the lag issue and most beta testers to date are complimenting the changes in the hardware. This might be the device that launches a thousand 3D headsets.